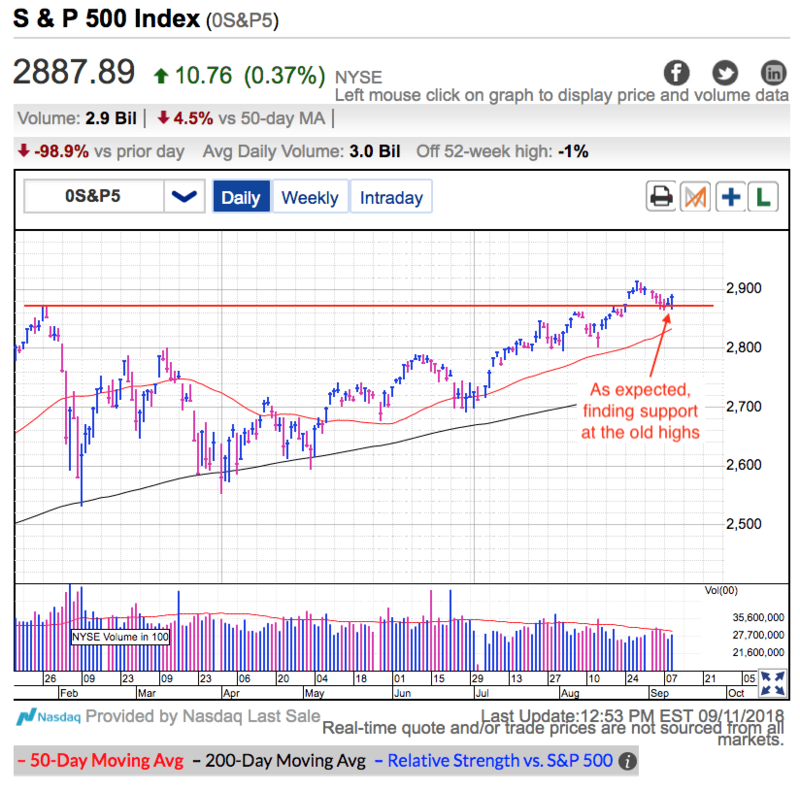 On Tuesday the S&P 500 slipped at the open after China filed a petition with the WTO to retaliate against US tariffs. But that opening weakness was as bad as it got and we quickly bounced into the green. This was the fourth day the market respected 2,870 support at the old highs. Traders are definitely more inclined to buy this dip than sell the weakness. As long as confident owners refuse to sell, supply stays tight and prices remain resilient. Make sure you sign up for Free Email Alerts so you don’t miss profitable insights like these. Trade war headlines were priced in months ago and we don’t need to worry about them. Owners who feared these headlines bailed out months ago and there is no one left to sell this recycling of the news. When no one sells the news, it stops mattering. The economy continues to hum along and that is the only thing that matters to the stock market. As long as the economic numbers look good, expect prices to keep drifting higher. Institutional money managers that were hoping for a pullback will soon be pressured to chase prices higher or else risk being left even further behind. Their buying will propel us higher through year-end. Unfortunately that doesn’t mean the ride between here and December 31st will be smooth and uneventful. Expect volatility to persist, but unless something new and unexpected happens, every dip will be another buying opportunity. Buying this 2,870 dip was better than chasing last week’s 2,920 highs, but it is too bad the market didn’t slip further and give us a more attractive entry point. I didn’t expect much out of this dip and that is exactly what it gave us. Since the market likes symmetry, we shouldn’t expect much out of this rebound either. The next move is most likely trading sideways near the psychologically significant 2,900 level. It will take time for those with cash to become comfortable buying these levels before we will start marching higher again. It’s been a rough few days for the FAANG stocks, but they bounced back Tuesday. AMZN and AAPL took a much-needed break following their breathtaking climb higher. Pauses and dips are a healthy part of every sustainable move higher and there is nothing unusual about their price-action. FB and NFLX continue consolidating following their tumble after second-quarter earnings. But there is also nothing alarming or unusual about their behavior here. Those were big losses and it will take a while before the market starts trusting these stocks again. Months ago traders who missed this trade were begging for a dip so they could jump in. Hopefully those traders are taking advantage of these discounts. Bitcoin keeps slipping and is barely holding $6k support. Last week’s rebound to $7.4k is dead and gave us another lower-high since we failed to match the previous $8.4k bounce. Lower-highs tells us the next lower-low is just around the corner. Since most owners refuse to sell, supply is scarce and we are getting into the grinding part of the selloff where each dip takes weeks and months to play out. The trend is most definitely lower, but we will continue seeing these short, tradable bounces higher. But each bounce is still a selling opportunity. The worst is still ahead of us.